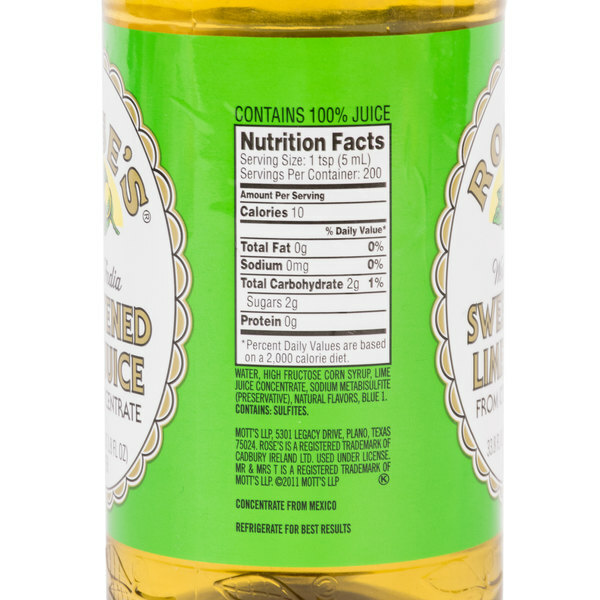 Rose's lime juice is a sweetened, concentrated lime juice, perfect for use in a variety of mixed drinks and recipes! This lime juice makes it easier than ever to add deliciously tart and tangy lime flavor to a variety of dishes and drinks. Marinades, dipping sauces, and sodas are just a few of the recipes you can enhance with a splash or two of lime juice. And, using a consistent, good quality lime juice saves preparation time from slicing and squeezing fresh limes. This lime juice is packaged in a plastic bottle, so it's easy to store in your busy kitchen or bar. The smooth, fluid consistency and tangy lime flavor of Rose's lime juice is perfect for blending into new salad dressings, sauces, and spreads. Or, try your hand at a classic favorite and delight your guests with a sweet and scrumptious key lime pie. And of course, no signature margarita, mojito, or guacamole is complete without a dash of lime juice! Eliminate the need to slice and squeeze whole limes, and add fresh, tangy lime flavor to any drink or dish with Rose's lime juice! For the perfect frozen margarita, blend 0.5 oz. Rose's Lime Juice, 3 oz. Mr & Mrs T® Sweet & Sour Mix, 1.5 oz. tequila, 0.5 oz. triple sec., and 0.5 cup of ice. Serve in salt-rimmed glass. Refrigerate after opening. It does not get any better than Rose's lime juice. If you pride yourself on making high end cocktails Roses is a must. If your using anything it won't measure up. There is no substitute for Rose's lime juice. There are other cheaper options out there but if you want to make a high end tasting drink Rose's is the only way to go. There are people in the world who will only drink cocktails that have Rose's. They call for it by name. This is the best price I've seen for Rose's. Love it. The Rose's lime juice tastes great and is a great bar to staple to have. Great for flavoring shots or any style cocktail or beverage. This juice goes a long way! It adds great flavor to our margaritas. The price is low enough to make this an inexpensive choice for the quantity. This is an authentic product, a liter of Roses lime juice, and is available at a price that i have a found to be unbeatable. I have found the best way to buy items like this is with paper products they ship well. Rose's lime juice is tart and tangy and super tasty. I love a splash of this lime juice in seltzer. It also makes a nice drizzle for bundt cakes! The Rose's lime juice is excellent. Love the flavor and the price per bottle. Great size and easy to pour. Makes a great tasting cocktail. Super fresh lime juice flavor and smell. A great bar juice and perfect for adding nice lime flavor to our drinks. A great price and buy. Rose's lime juice is tart and sweet making it great for our baking. It makes a great key lime cake and our kids love the flavor in their water. Love Rose's Lime juice for our bar and the I liter bottles are great for each bar station. The juice is fresh and tangy. A great way to kick up beers or cocktails. I generally use this the most at my bars. There are a lot of different drinks that call for lime juice and this is my go to. Thank you! 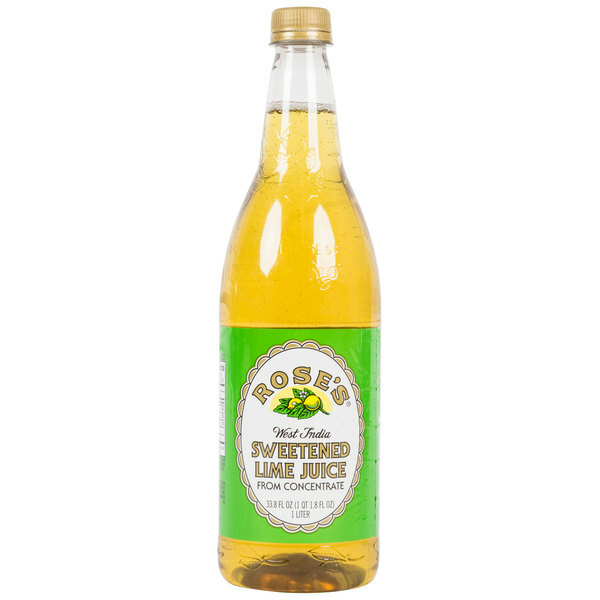 A great lime juice form Rose's that is perfect for adding a splash to beer. We keep these on all the tables at our pub and guests love it. A great way to kick up all kinds of beers and cocktails. Roses Lime is my favorite lime for cocktails. The taste is amazing and it’s a quick and simple solution if you don’t want to squeeze limes. Great price for one liter! Great Price for rose's Lime juice. Much cheaper than distributor for the same product. Added to order and my shipping didn't change. So why not save a few bucks. I love Roses lime juice for drinks but I've also used it mixed with powdered sugar for glazes for baked goods. It makes a good tart glaze. A great brand of lime juice that is perfect for making lime cokes and other mixed cocktails. The flavor is excellent and the bottles are perfect size. This lime juice is like no other. It is like it is made for making cocktails. I put it in my vodka sodas or margaritas and find the taste to be so much more fresh and authentic than other brands. We love Rose's lime juice for its fresh tasting flavor. We also love the bottle because it makes it easy to pour and easy to handle. It's a classic ingredient for so many drinks. We also use in one of our spicy, tangy sauces. The price is right and we're able to get case order discounts.